Remove Spell Counters from your field to activate 1 of these effects. ● 2: Return 1 "Mythical Beast" Pendulum Monster you control to the hand. 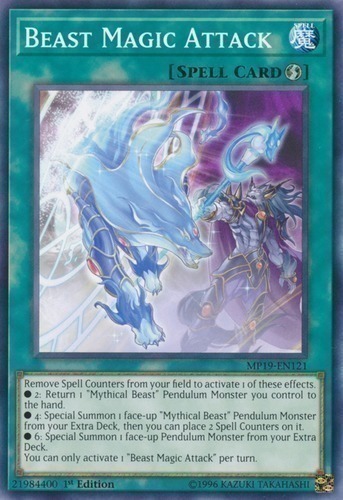 ● 4: Special Summon 1 face-up "Mythical Beast" Pendulum Monster from your Extra Deck, then you can place 2 Spell Counters on it. ● 6: Special Summon 1 face-up Pendulum Monster from your Extra Deck. You can only activate 1 "Beast Magic Attack" per turn.